LIVINGSTON, NJ – (March 20, 2018) – Med Ad News, the leading pharmaceutical business and marketing publication, announces the nominees for the 29th Annual Manny Awards, celebrating the best in pharmaceutical and healthcare advertising, and announces Sharon Callahan as the Industry Person of the Year. The Manny Awards annual gala event celebrates creative excellence in healthcare advertising and communications. More than 600 industry peers are expected to join Med Ad News in honoring winners across 20 total award categories, including the year’s Most Creative Agency, Most Admired Agency, Best Launch Campaign, Agency of the Year I, II and III, and more. The Manny Awards ceremony will be held on Thursday, April 19, 2018, at Pier Sixty at Chelsea Piers in New York City. The Med Ad News “MedAdvocate” jury met on March 15 for a roundtable discussion of finalist campaigns previously determined via online voting, and included selections from more than 100 eligible voters across healthcare communication agencies. In order to take a deeper dive into the finalist campaigns, a panel of experts dubbed “MedAdvocates” were each assigned specific campaigns and tasked to initiate meaningful dialog amongst the jurors. MedAdvocates were selected based on their creative expertise and widely recognized performance within the industry. Ultimately, the team scored each finalist campaign using a point system that, combined with the popular vote conducted online, arrived at the eventual winners to be crowned on April 19, 2018. Med Ad News is excited to recognize as its 2018 Industry Person of the Year, Sharon Callahan, CEO of TBWA\WorldHealth. The global agency network was formed in April 2016 when Omnicom Health Group announced the combination of two of its healthcare agency icons, LLNS and Corbett, under the TBWA\WorldHealth brand. Callahan also serves as Chief Client Officer of Omnicom Health Group, helping clients access Omnicom’s deep healthcare talent and developing engaging innovative approaches for teamwork to maximize results for Omnicom’s largest healthcare clients. Callahan’s 30+ years of healthcare marketing is a synthesis of strategic skills developed in consumer and professional advertising, medical education, clinical programs, publishing, and digital. Consistently helping clients to leverage their value through the seamless integration of multiple communication channels, her boundless energy is credited with promoting excellent communications and maximized sales. Innovative and entrepreneurial, Callahan built her career at Omnicom as Executive Vice President and Director of DAS Healthcare and CEO of LLNS (now TBWA\WorldHealth New York). Prior to her 10 years at Omnicom, Callahan was Chief Digital Strategist at Grey Healthcare Group and President of the interactive agency Summit Grey, born out of The Summit Group, a company she co-founded. Previously, Callahan honed her talents at Medsite.com and SCP Communications. In both 1997 and 2005, Callahan served as president of the Healthcare Businesswomen’s Association (HBA), the industry’s largest professional organization. She currently sits on the boards of the HBA Metro Chapter, the Arthritis Foundation, Women Against Alzheimer’s, the 4A’s Government Relations Committee, and the LGBTQ Victory Fund. 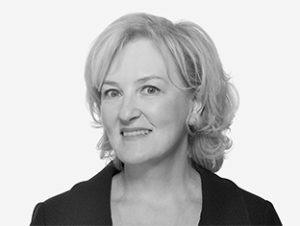 In June 2014, the Women’s Venture Fund recognized Callahan with its “Highest Leaf Award” for her strong business leadership and substantial contributions to the advertising and healthcare industries. Med Ad News congratulates Industry Person of the Year Sharon Callahan and all award nominees. 2018 event sponsors include: Platinum sponsors Calcium and McCann Health; Gold sponsors Concentric Health Experience, Dudnyk, Fingerpaint, GSW, JUICE Pharma Worldwide, and TBWA\WorldHealth.